So far, I’m managing to keep the promise that I made to myself a few months ago. In case you don’t remember, I was floundering when it came to completing the decorating of our new-to-us twenty year old home that we remodeled. I wasn’t focused and made purchases whenever I saw something I liked or that I thought was a bargain. Here’s a secret – no “bargain” is ever a bargain if you’re only purchasing it because the price is good. Anyway, what was the promise that I made to myself, you ask? I promised myself, that as much as I could, I would only focus on one.room.at.a.time. Ever since I made that promise, I’ve managed to finish our family room, our breakfast area and most recently, our dining room. And now, I’m ready to start on the makeover of our home office. I’m going for a rustic, farmhouse, slightly industrial, slightly masculine feel in this room, since Pookie is the main user. 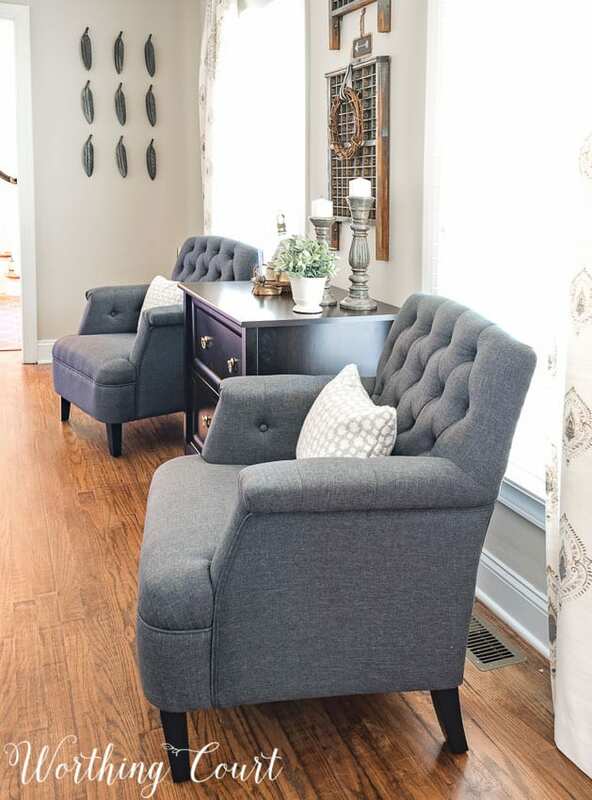 I’ve already corrected one of the “bargain” purchase mistakes that I made by replacing the chairs that were here with two of these gorgeous arm chairs from Hayneedle. This post contains affiliate links for your convenience that are at no extra cost to you. See my full disclosure policy HERE. The “bargain” purchase mistake that I made was buying two teal and off-white arm chairs, mainly because they were a good price. There was nothing wrong with them and I actually think they’re pretty chairs, but this is NOT the direction that I wanted to go AT ALL in our office. 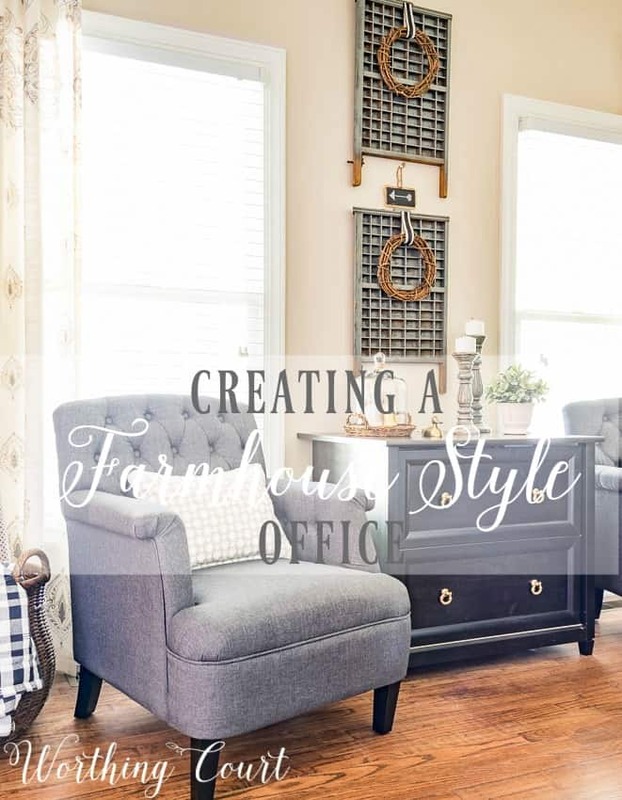 They’re too modern looking for the farmhouse vibe that I’m going for in this room. I’m hoping that they’ll work out in one of my guest rooms. I have plans to paint the file cabinet, but for now I have it temporarily staged with a few items from my stash. I found the vintage printer’s trays, that are hanging on my wall, on a recent shopping trip to a local haunt. 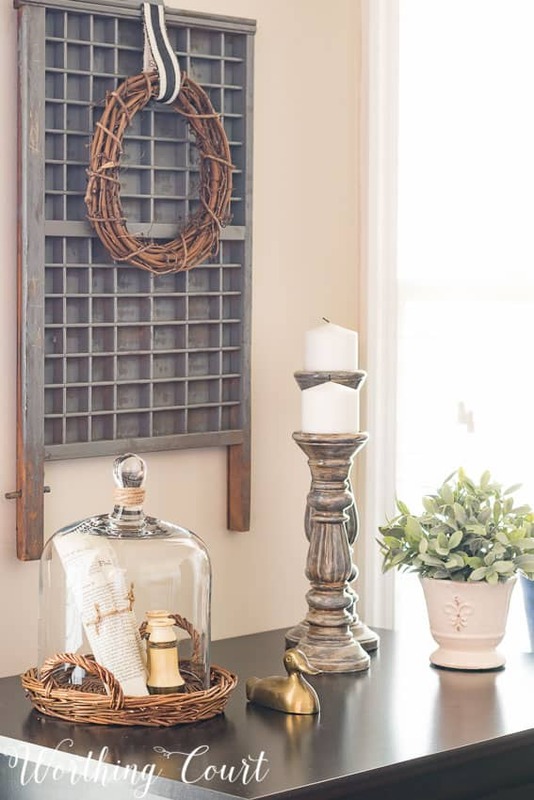 I love layering and texture, so two grapevine wreaths held in place with black and white ribbon are a nice touch. But back to the chairs. Hayneedle was so gracious to provide me with them so that I could review them for you. I’m amazed at the attention paid to the details on these chairs. The stitching and diamond tufting is perfect. No loose threads, skipped stitches, wrinkles or out of place tucks in the fabric. The buttons are all securely fastened. The arms are neatly and securely wrapped with fabric. I just love the color and texture! The welting is perfectly attached – no waviness or places where it isn’t well attached. No raw edges of the fabric are showing anywhere. To be specific, these are the Baxton Studio Jester Arm chairs that can be found on Hayneedle’s website. They are mid-range in price, have a firm seat and are not huge chairs. They’re the perfect solution for our small’ish home office. 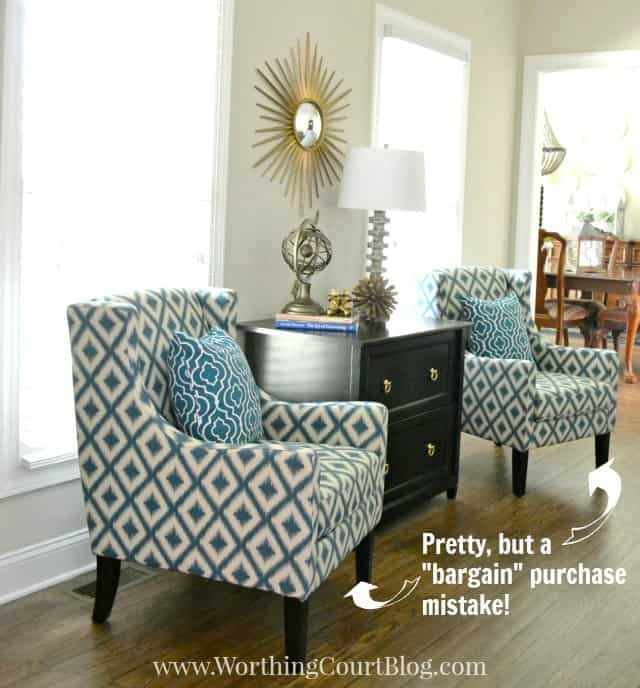 How about you – have you ever made any “bargain” decorating purchase mistakes? Or did you wise up a long time before me and learn to be patient? Thank you to Hayneedle for providing me with two of the Baxton Studio Jester Arm Chairs. All opinions expressed are my own. Your chairs are gorgeous and look beautiful in the space! I can’t wait to see how the rest of the room turns out! I hope that you have a very Happy Monday! Thank you so much, Shannon. Happy Monday to you too! I made myself the same promise this year when new floors started the domino effect; the wall color look awful with the new floor so new wall color which look awful with the color of the Dining room table/chairs so paint and reupholster . . . . pretty soon I was so overwhelmed I couldn’t even think about it. So I made a list (by room) and made myself work room by room . . . SO HARD!! But it’s working AND I’m getting better results! 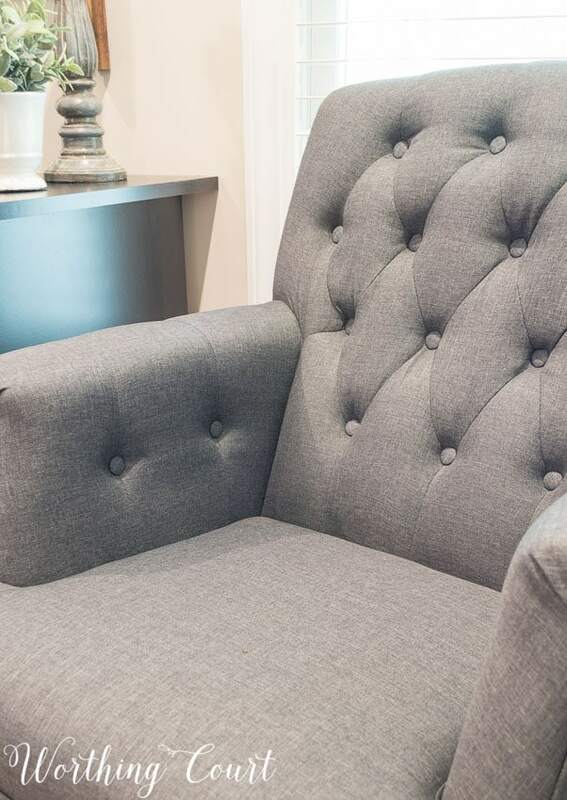 Thanks for sharing, Hayneedle looks like a great resource for those new club chair I want for the Family room (lol). I’ve been amazed at what a difference it has made since I made that promise to myself and have kept it! Best thing I ever did and I feel like I’m getting so much more accomplished than just doing bits and pieces in all of the rooms. So smart of you to make a list! My biggest decorating regret was purchasing two floral print loveseats back in the early 90’s. They were stunning for a few years and now I cannot stand to look at them. They are stored in my basement until I can figure out what to do with them. Recovering them is too, too expensive! I now only purchase solid covered pieces and change out the look with pillows. If only I had known then what I know now! Thank you for this post. I’ve made a commitment to finish all the rooms (mainly bedrooms, baths and office) in my upstairs – hopefully by Christmas. Then next spring my my main floor – extra large great room, large kitchen, guest bath and dining room (which has always just been the piano/sitting room – trying to think of a better use for it than just passing through for the most part). Then next fall update the finished basement for the last of my 6 children that will then be in college. Thinking Grandchildren play room for the extra room down there. * I especially wanted to say thanks for your link to Hayneedle. I have never heard of it and think I found the perfect headboard for my guest room. The prices are very good. Again, Thank you for your post!!! Oh wow, Teresa! You are going to be a busy lady. Have fun with your makeovers and updates! So glad you were able to find something at Hayneedle. They’ve been great to work with. 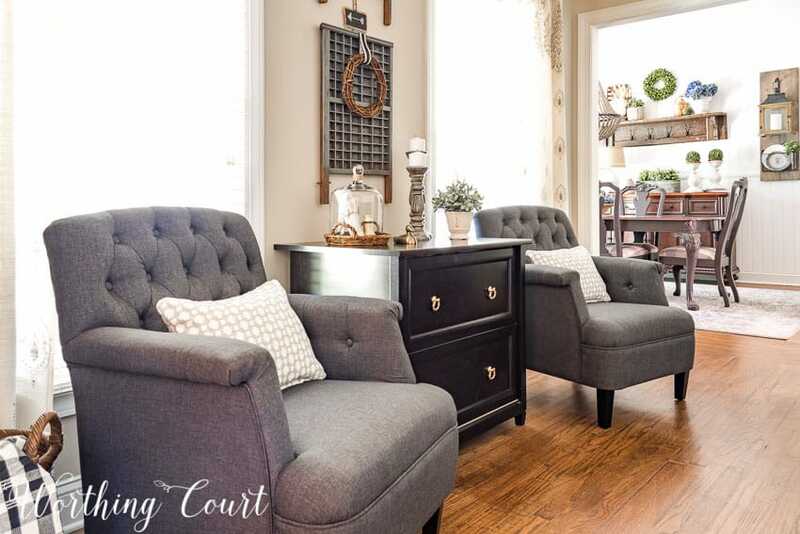 I love how you have your file cabinet between the chairs…doesn’t have an office feel to it at all. The printers trays are such a nice find and I like how you didn’t put anything in the individual boxes. 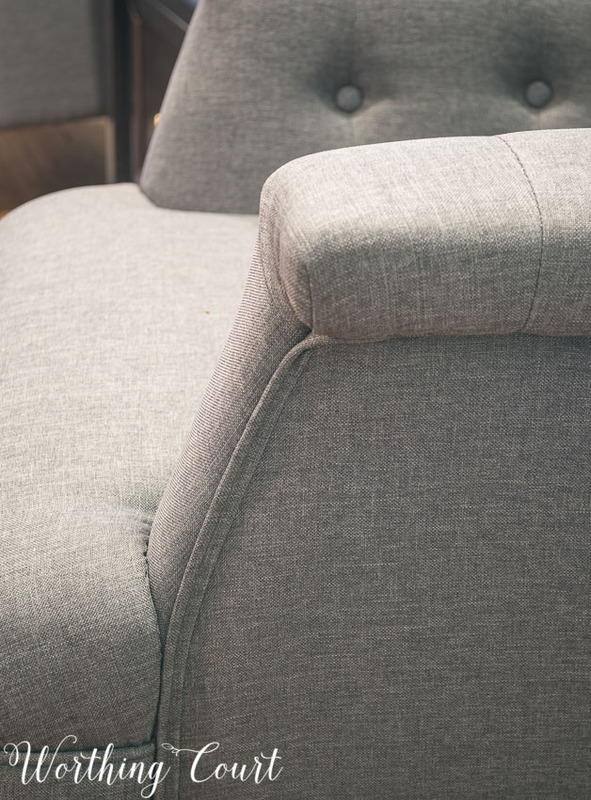 Your new chairs are lovely – I hope the other set can find a happy spot elsewhere in your home. P.S. I think the dining room is looking very nice in the background. I kind of like that view too! I need to follow your rule on bargain mistakes! I’ve made plenty of them over the years, mostly smaller things. Some never get used, others are given away and the rest are tossed to the trash. Can’t wait to see what you do with the office! Your desk would look great painted and glazed. I’ve been looking for chairs for my living room for AGES. I can’t seem to find any that have high backs without being one of those odd funky chairs when I’m going for a more traditional/transitional look. I haven’t gotten myself around to using gray yet, but I have moved to the griege look some! I love these chairs, but I checked them out and they are only 34″ and I’m looking for a minimum of 38 and preferably 40″back. They are hard to find. 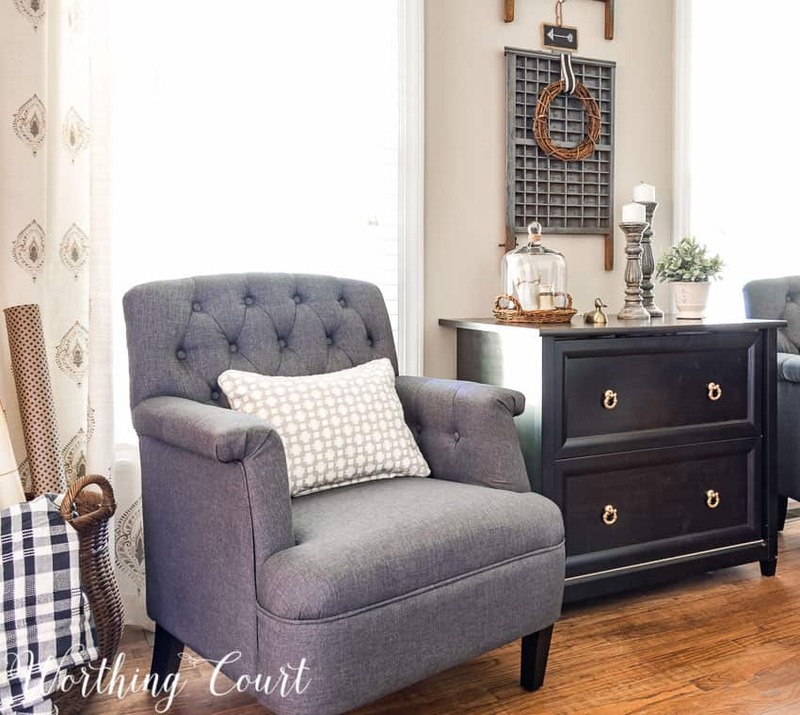 Love these chairs and it sure helps to see them in a room instead of just a picture on a website. You made a great pick on these! Wow, now there’s a great idea – where are you going to look for the taller legs? 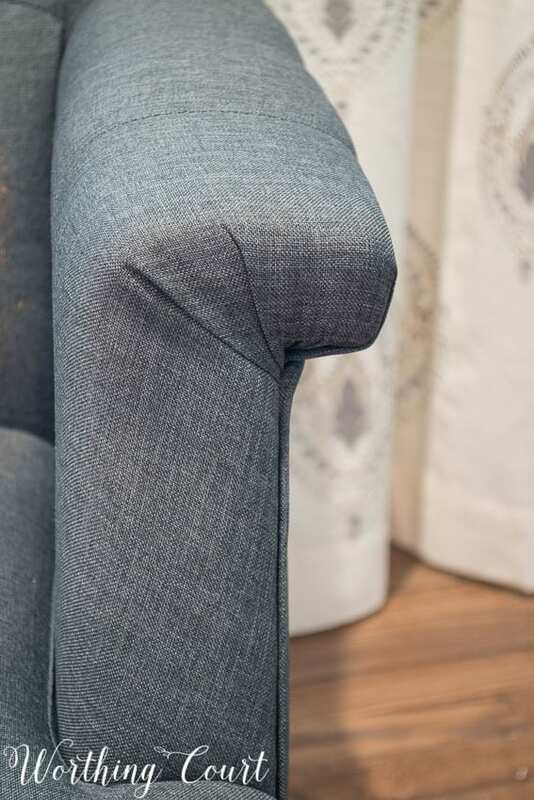 Are chairs standard with how their legs fit? This goes into an area I’m really not familiar with! This idea would sure make picking the chair I like more of an option. I just can’t get over this great idea!! Any tips or ideas for me to be able to actually do this?!! I’ve seen unfinished legs, with the screws already attached, at the big box home improvement stores. I’ll probably do some searching online too. I’ll be sure to share here on the blog whenever I do it. I’m hoping the screw size is standard, but I guess that’s something I’ll find out when I give it a try! Fixer Upper is indeed my favorite show! I made a trip to Waco with gal pals just to see the Magnolia Market. We were not disappointed with any of the market or Waco. Can not wait to visit again. I love your office because it doesn’t “look” like the typical office. Keep up the decorating and love your blog as well. I just stumbled across your blog and I love your house and your decorating tips. Would you mind sharing your paint colors of your walls. I love how the rooms feel neutral, but still warm. Some neutrals feel like the builder grade paints and feel so uninviting. I love how yours are cozy and inviting. Hi Jennifer. I know exactly what you mean about what I call “builder beige”. We painted the entire interior of our house with Sherwin Williams Accessible Beige. I just love your home! 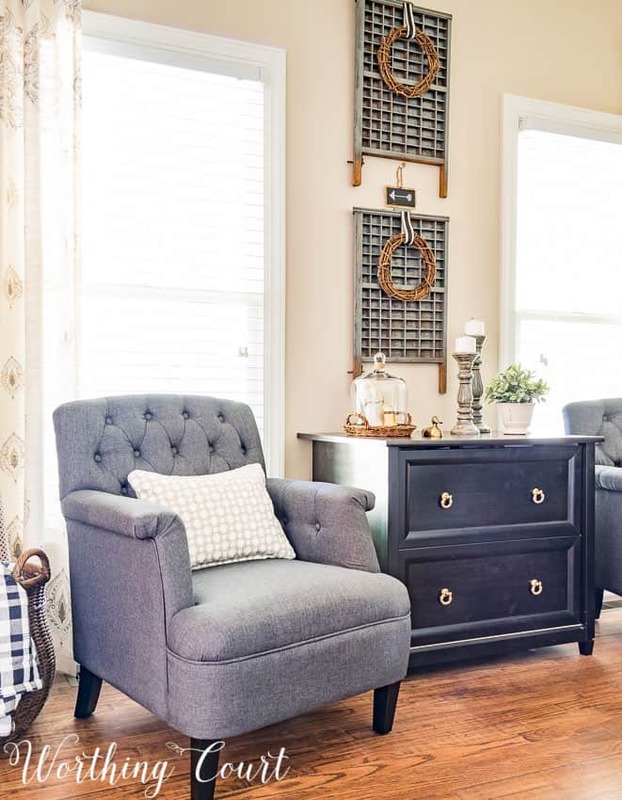 The soft grays create such a warm farmhouse style. It just says HOME! !!! So inviting. … thanks for all your inspiring ideas.